Introduction to Vault - My Code Smells! We all have something to hide, I think everyone has to admit that. Being a developer you need to store lots of passwords, tokens, addresses and other pieces of information that you should not reveal to anyone. You could keep them all in a text file, but a part of you knows that you really should not. What are the alternatives? Let's look at one of them, Vault, which is an awesome project by Hashicorp. Like with many tools, it's easier to say what it does than what it is exactly. If I had to, I'd say that it is a storage for your secret data, which has two levels of security one must pass in order to get the information. While the way it works is always the same, it can be backed up with different means of actual storage: it can keep data in memory, in a file, and more. Except for those two levels, which I will describe in a moment, a special characteristic of Vault is that it acts as a server providing an HTTP API to the data it guards. It can, obviously, be configured to restrict access to some data, make some keys read-only for everyone, or for a particular group of users. The configuration is done using HCL files (HashiCorp Configuration Language, more on them here). 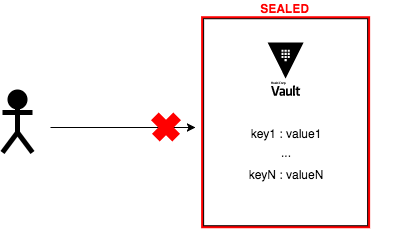 Since Vault is a storage for secrets, its main use case is pretty straightforward. You can use it as a place you keep all private information important for projects you are working on (and everything else you want to keep private, really), but it can also be used to share that knowledge across members of your team. It allows you to give and revoke access to the users identified by personal tokens, making sure that only particular pieces of your know-how are visible to authorized personnel only. 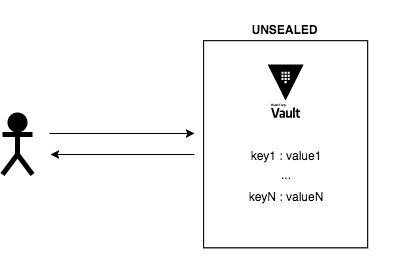 Recently I've been playing around with Vault as a local secret storage (for MySQL credentials, tokens to various tools, etc.) and I found that it made my work much faster when I need to log in somewhere. Probably I saved the most time because I now access information from within my console so that I don't force myself to switch windows and click it out, but it was possible thanks to Vault after all. I might have found some other, ready tools to do that, but nothing beats a fun side project with helps you on the daily basis, right? key treshold indicates how many of those generated keys are required to unseal your Vault. What if you discover (or suspect) that your Vault has been attacked, you should immediately seal it. That immediately is crucial here, as unlike unsealing, you don't need any keys to seal the Vault. Again, sounds reasonable since you need to do that as soon as you realize something is wrong, right? How does this look using the command line? We might get started by using Vault in development mode but it is very limited. While we might be fine with playing around with storage kept in memory, the dev creates Vault which is already initialized and doesn't require keys to seal or unseal (you do that without passing the key at all). That's why we'll create a simple configuration file and pass it to the vault server command. Error authenticating: Error looking up token: Error making API request. Yep, we cannot do anything because the Vault is sealed. What if we unseal it with one of the tokens? Now, what if we want to login? Error reading secret/foo: Error making API request. This was just a basic introduction to the Vault and what it is capable of. Next posts will describe some more advanced topics including managing access, using Vault via Go client, etc. Stay tuned!